table setting, originally uploaded by ordinarymoment. It was so great how friends + family were so willing to lend a hand to help. My mom in-law and I worked together to sew up smaller square tablecloths to add some color to the middle of each table. 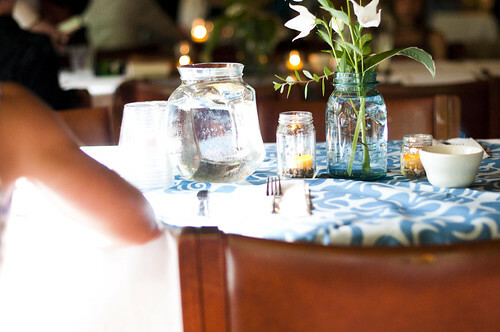 We picked out blue, grey, and greenish fabric from Ikea with bold graphic patterns to lay out diagonally over the big white tablecloths covering the rest of the table. We now have some pillows + curtains in our house sewn up from the little tablecloths after the wedding. Since it was a hot July day, we rounded up glass pitchers to fill with cold water from friends + family. My favorite collaboration was the flowery + green centerpieces. We went to a few local farms to try and purchase bulk flowers to arrange ourselves, but didn’t end up finding what we wanted at a reasonable price. So, the day before the wedding, we rounded up mostly white + a few light yellow flowers, along with lots of shades of greenery. Hostas, sedum, ferns, any interesting foliage we could find. It felt pretty special to be able to make an arrangement using lovingly grown plants from our nearest + dearest. I was able to arrange each centerpiece the day before and keep them in the huge fridge at the nature center. I loved the airy, natural feel of all our greens + flowers in the glass jars. Exactly the just-picked wildflower look we were going for and F-R-E-E. Perfect.